The unbearable heat continued and, learning our lesson from the previous day’s mild outing, we stayed largely at home. 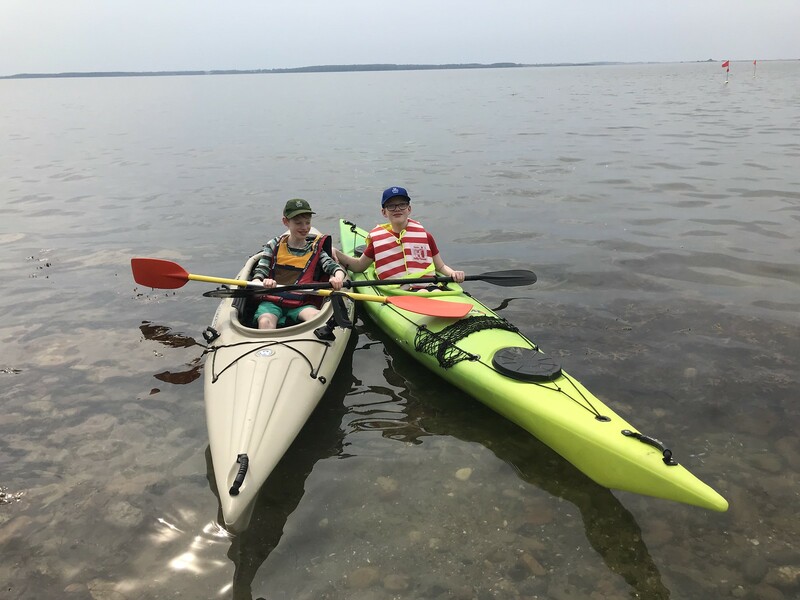 We swam, we kayaked and we went to the supermarket. We asked the woman at the checkout whether there was in anywhere in Kirke Hyllige (our local village) that might provide us with a cup of tea. She looked like she thought we were absolutely crazy. No, there was not. 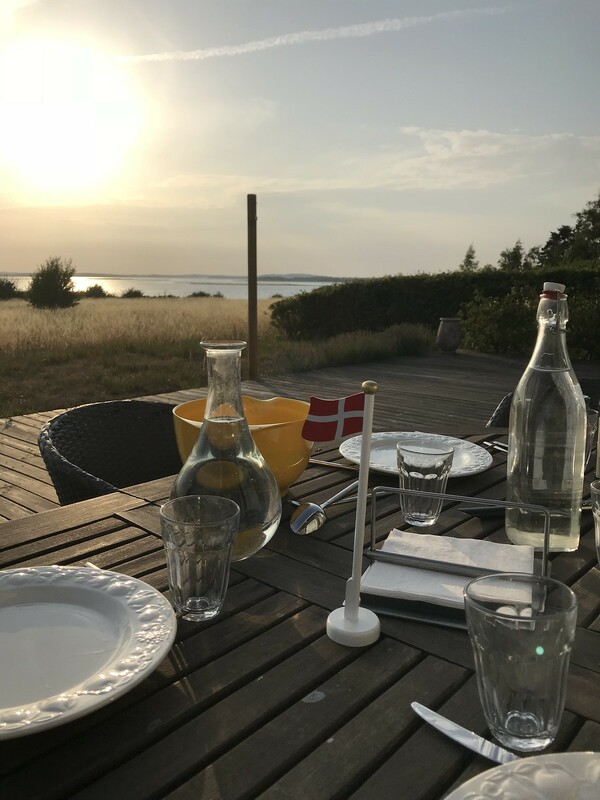 It turns out that rural Denmark does not have a thriving café culture. 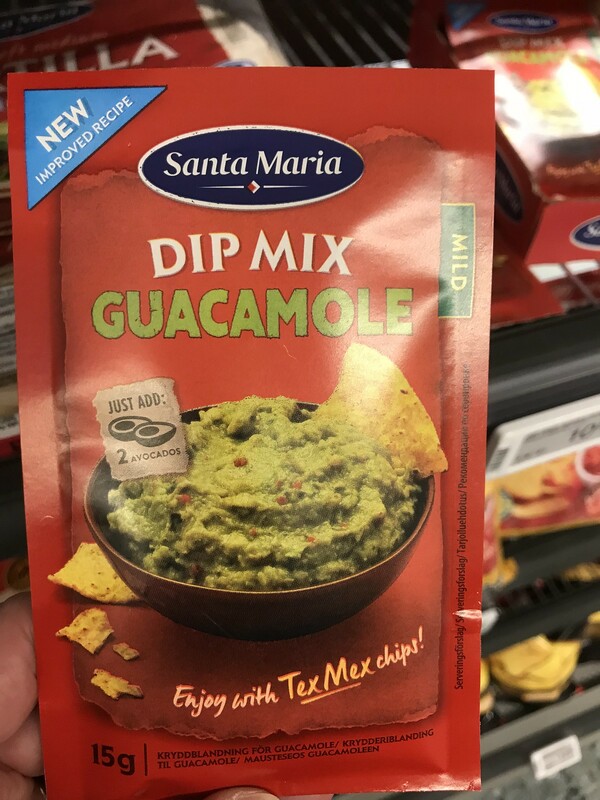 What rural Denmark does have is guacamole in a tin (unbelievably revolting notwithstanding being 1.5% avocado) and just add avocado guacamole in a packet. After practically not leaving the house on the previous day, I felt obliged to force everyone out. 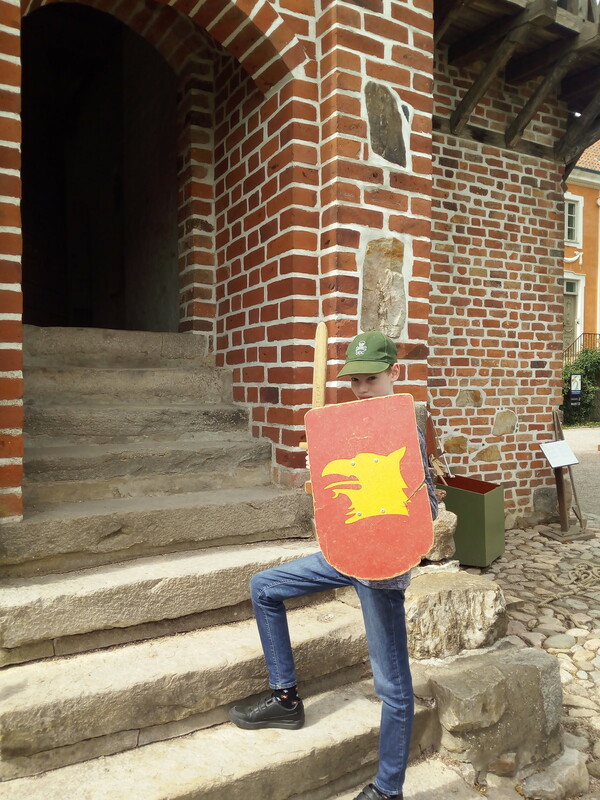 We went in to the Viking museum in Roskilde. This features 5 original Viking boats that they dredged up from the harbour and put together again like the world’s largest jigsaw. Thrillingly, one of them was made in Ireland (they could tell by the wood apparently – if I understood correctly, it was made in Glendalough but that seems an unlikely degree of specificity in relation to a 1000 year old boat dredged up from the bottom of the ocean – I watched bits of the educational video in Dutch, Italian and Spanish but English never seemed to come up so my understanding may not have been 100%). Everyone who worked there when they heard we were Irish was keen to tell us about the Irish boat. 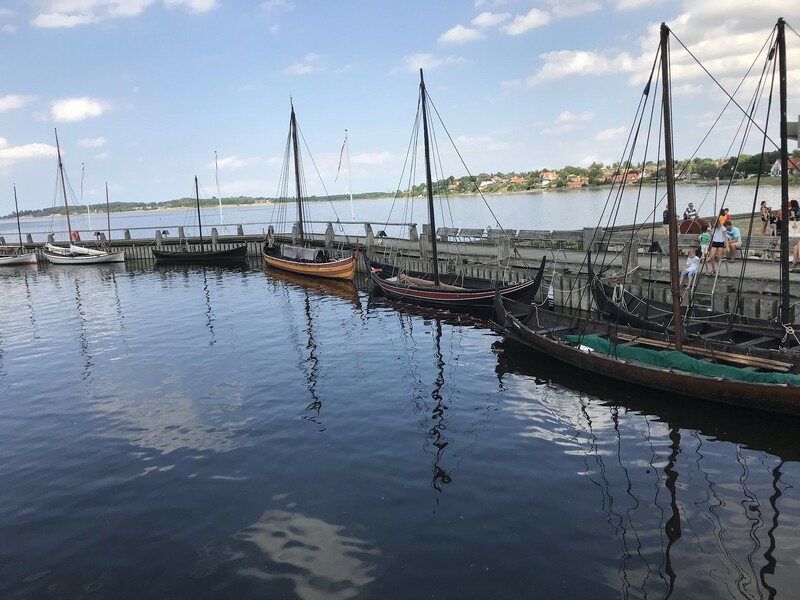 There was a Viking boatyard where they made Viking boats using original Viking tools (is that a bit too authentic?). 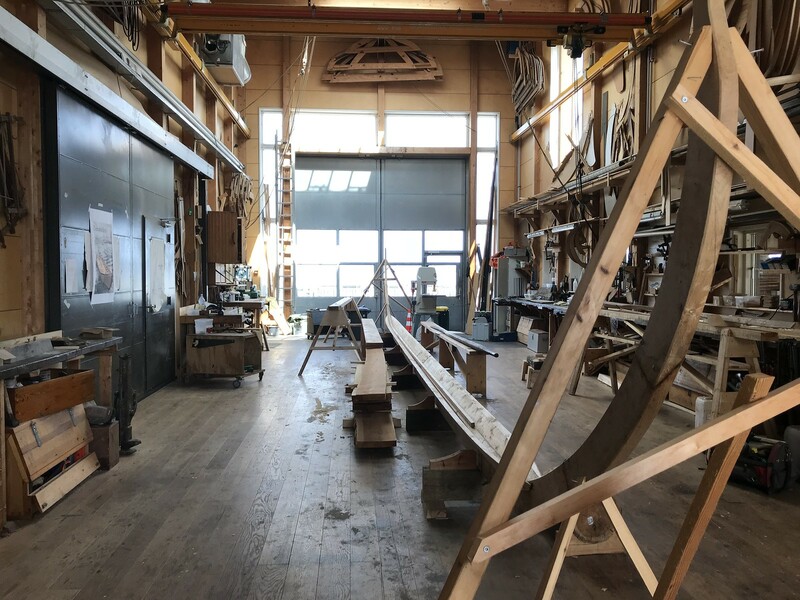 I took lots of pictures for Michael to show to his woodwork teacher but he said that I had fundamentally misunderstood the nature of teacher/student interaction and he would not be sharing them. 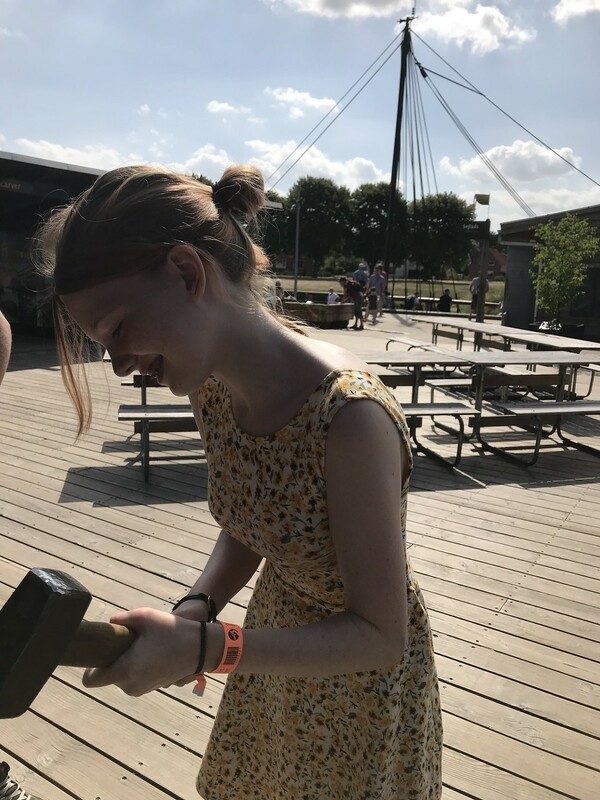 There was a place for hammering out coins, a forge (the heat, the unbearable heat), a chance to paint your own Viking shield and, of course, lots of boats – the originals and the reconstructions which you could wander on to. All of the Danish staff were cowering in the shade assuring us that the weather was never like this normally. 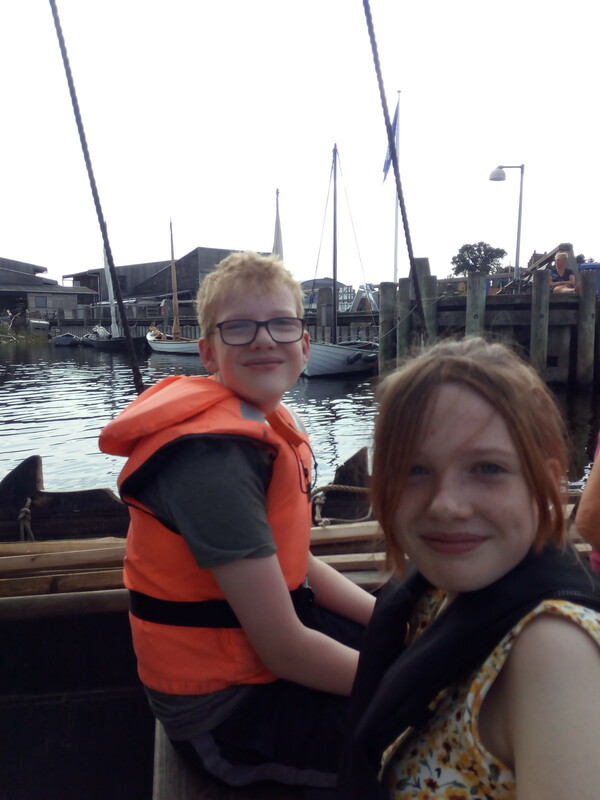 We went for what would have been quite a nice lunch on site if we hadn’t been rushing back to take our sailing trip on a reconstructed Viking boat. The sailing trip was a mild highlight. 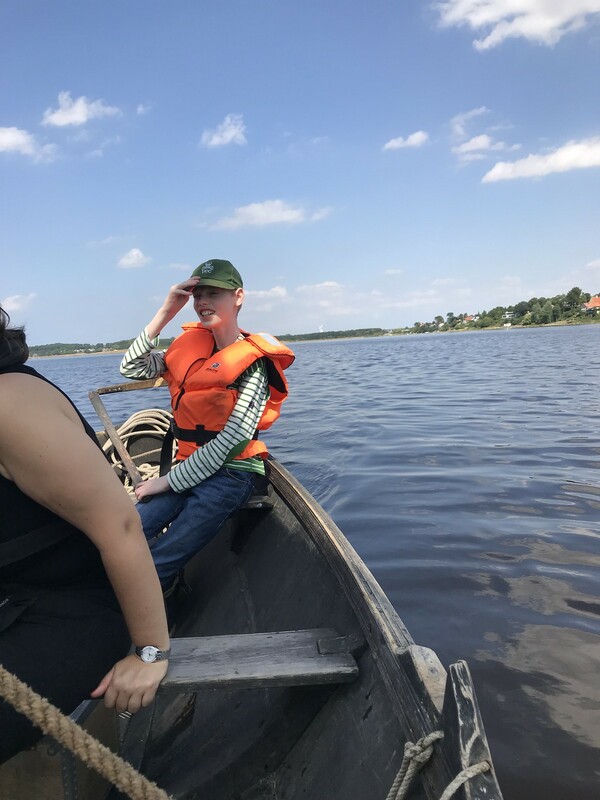 We rowed out in to the bay and then the staff member who was captaining the boat and slightly despairing of the abilities of his motley crew asked who would like to steer. Almost before he had finished asking, Michael was up at the tiller. Did he enjoy it? Very much. Was he any good at steering? Maybe a bit less so but he learnt a great deal on the trip and we definitely didn’t capsize. I bought a small wooden Danish flag and flagpole in the gift shop. You wouldn’t understand, you weren’t there. 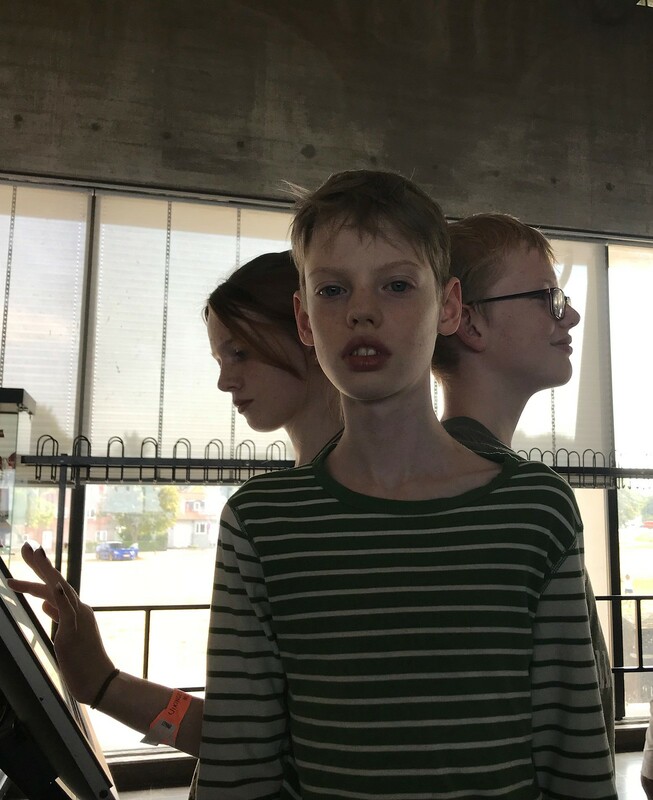 On the drive home, Michael regaled us with the reasons for the collapse of the Venetian city state so that by the time we got back we were all ready to walk to the ice cream kiosk. 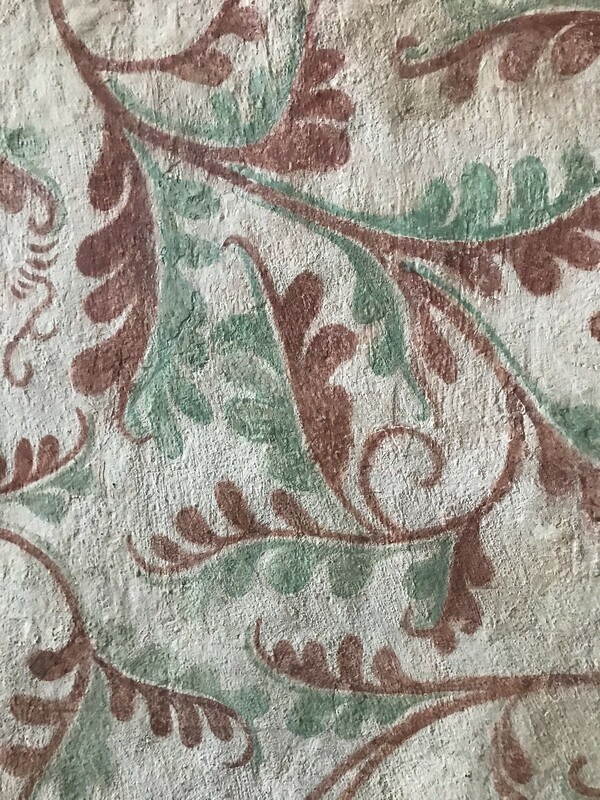 It was a chance for me to mull on the wasteful ways of the Danes as we walked there on a carpet of ripe plums. That night there was a storm. I was worried about herself in the annex. She was fine although she did say that she did not enjoy the sound of the rats with their scrabbly paws under her annex built on decking. They were probably sheltering from the rain with a supply of plums. I think it was on this evening that the boys wanted to look at the lightening and I said, “It’s not lightening, it’s fireworks.” It was lightening, impressive lightening. 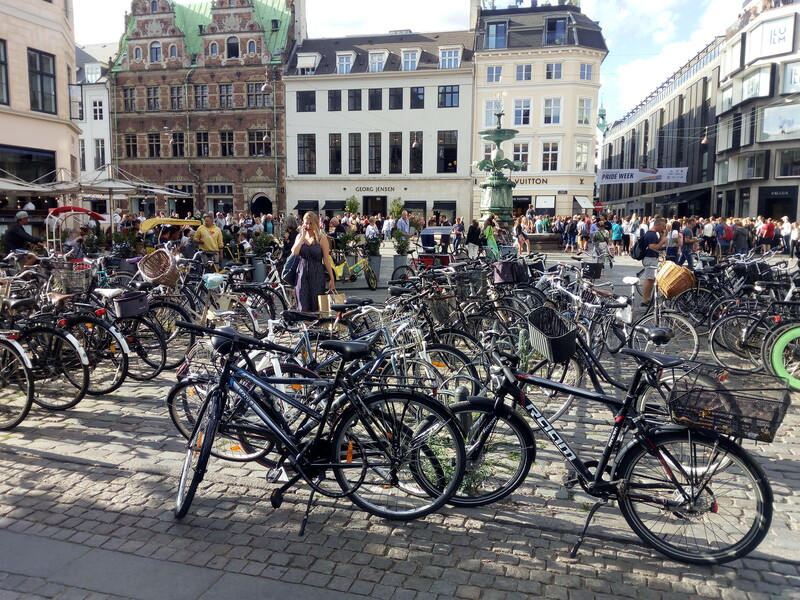 We plucked up our courage and drove in to Copenhagen. It was only about an hour away. We thought that as it was a cycling paradise we might run into some problems with the car. Cycling paradise it may be but, it turns out, there are still plenty of cars. Also we found the sat nav (whom we christened Sybil because she definitely sounded like a Sybil) invaluable. 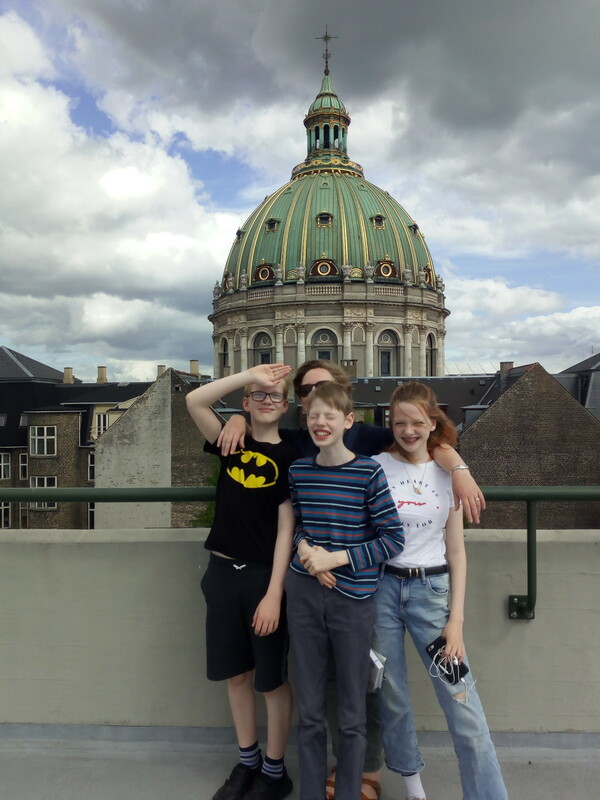 Sybil guided us safely to a multi-storey car park where the parking was pricey (€40 for 6 hours so not atypical of Danish prices) but there was plenty of it and a great view from the roof where we ended up parking. 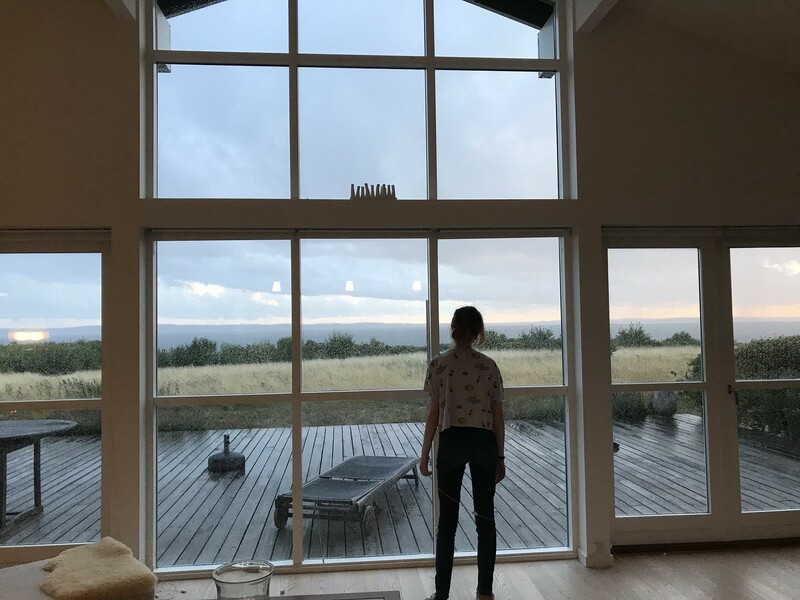 Excellent photo of roof view; maybe not fantastic photo of us. We had lunch nearby which was grand but not amazing actually, in general, we found the food a bit mediocre; I’m not sure whether it was down to our restaurant choosing skills or Danish cuisine. 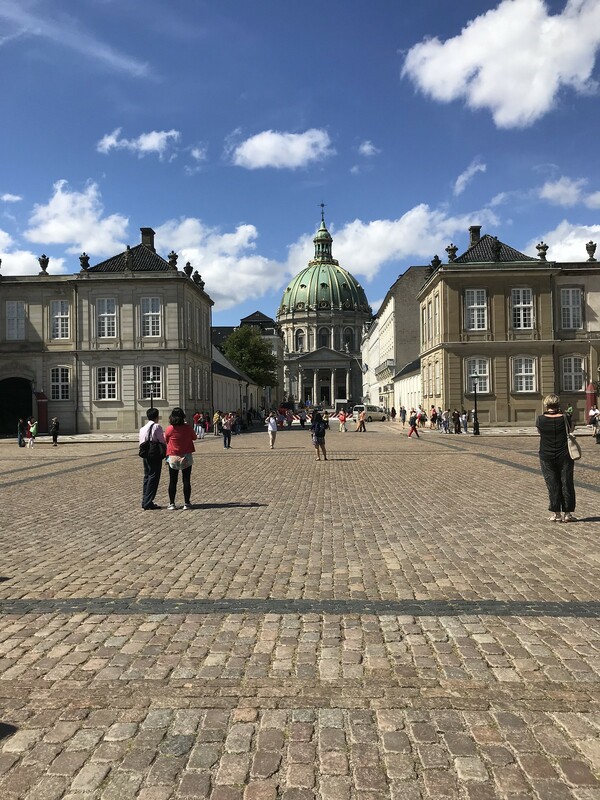 After lunch we wandered down to the Amalienborg slot (castle, try to keep up) and after some judicious consideration decided that we would gain as much if not more from looking at the outside rather than going in for a tour. 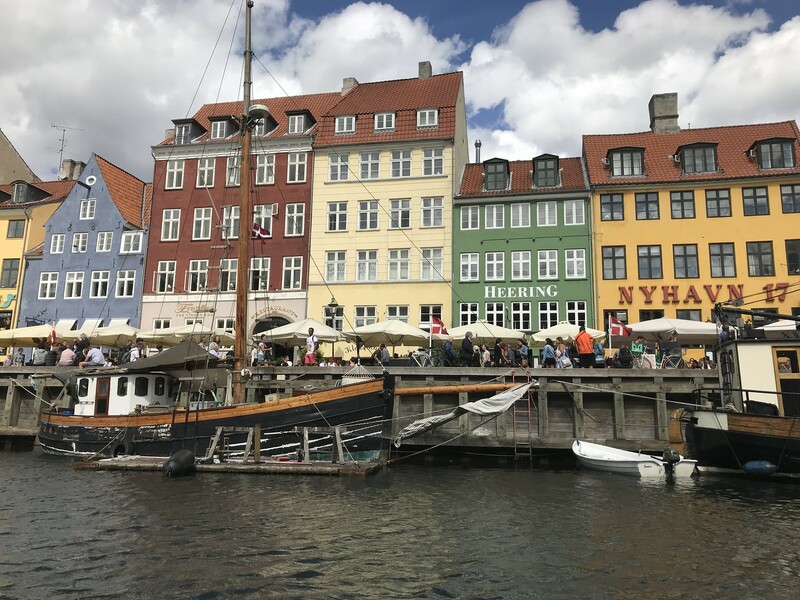 We dutifully went down to Nyhavn which is right up there with the Little Mermaid in the famous views of Copenhagen postcards. We actually passed it on the way in but due to complete reliance on Sybil, we failed to look around so missed it. We went on a boat trip which was grand in the manner of these things. We saw the Little Mermaid and various other worthy sights. I have come away from Denmark wondering how many castles one royal family needs. 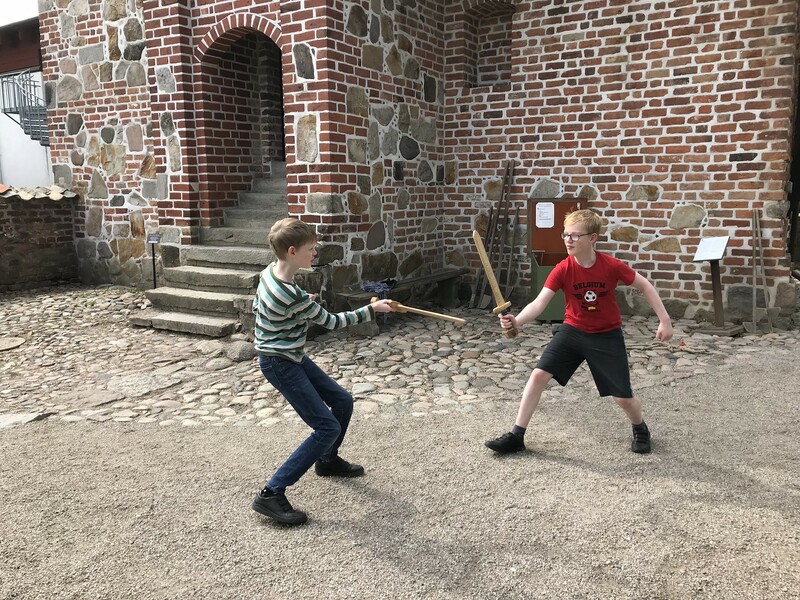 By way of example, a castle in the North of Zealand (the island bit that Copenhagen is on and where we were staying – we didn’t get as far as Jutland which, although attached to the European mainland boasts the more remote parts of Denmark) was advertised as “one of the Queen’s favourite summer castles”. The boat also circled the Danish royal yacht which is called, of course it is, the Dannebrog which means the Danish flag. Is anyone surprised by this? We went for a cup of coffee in Conditori La Glace which got great billing in our guidebook. I have to say, they were not wrong. Really excellent cakes. Michael does not like sweet things so he had a bread roll. Sometimes I wonder where this child of mine came from. 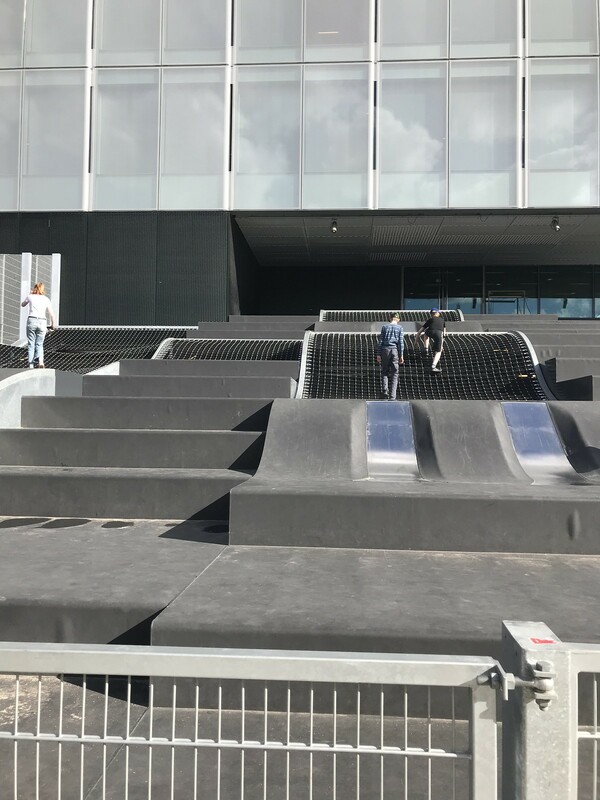 Notwithstanding assistance from google maps, we managed to get lost on the walk back to the car park so had an opportunity to explore the canals and also the outside of what I think was the architecture museum which incorporated slides and a net for climbing in a very cool Danish way. We had a quiet morning after the activity in Copenhagen the previous day. 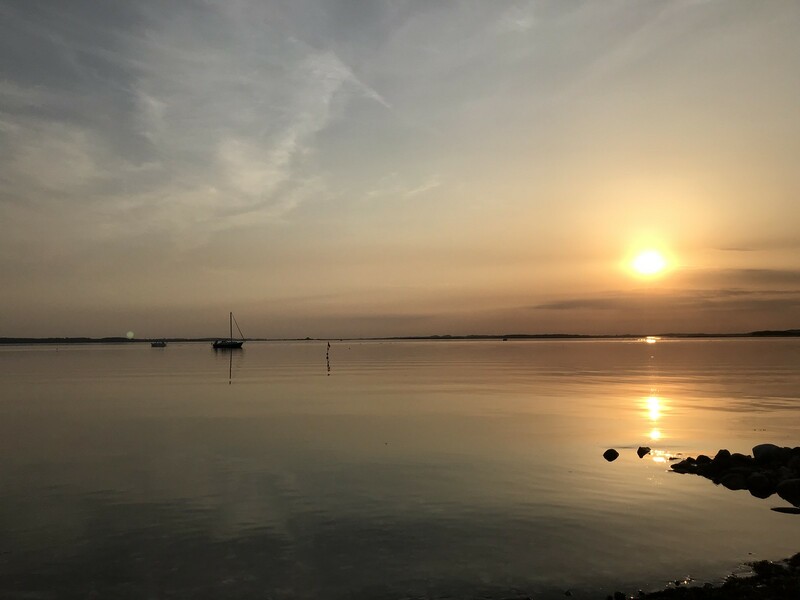 In the afternoon we went into Roskilde. It turns out that everything in Denmark closes at 2 on a Saturday. Who knew? The city centre was, yet again, like a morgue and even the tourist information was closed. Who, who closes tourist information offices at 2 on Saturday? And yet, a part of me rejoices that commerce hasn’t overtaken everything and that shop workers as well as office workers get to enjoy their weekends. That part was not uppermost as we took ourselves to the out of town Lidl (open, happily) and ran from the shop to the car park in the lashing rain. 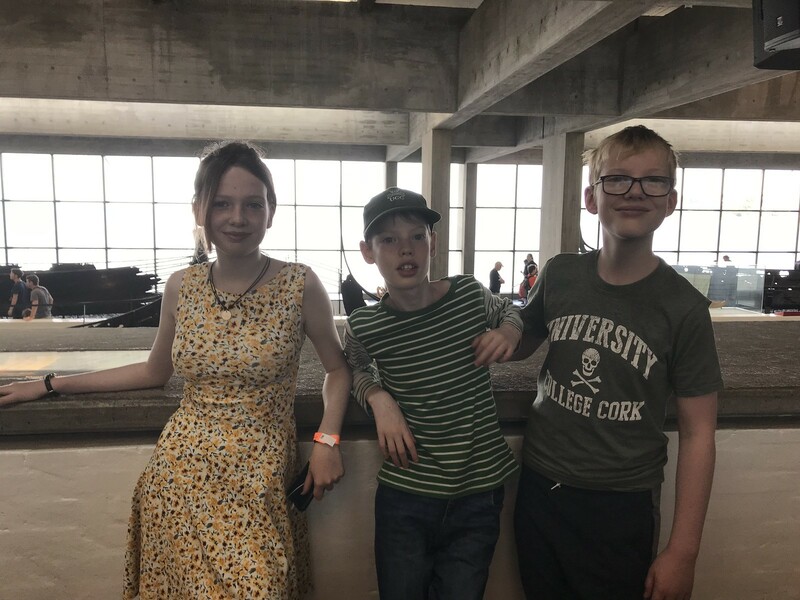 However, on the good news front, although the cathedral was closed at 2, there was a sign saying that it would reopen at 4 so after a restorative cup of tea in the square, we took ourselves inside. I am a veteran of cathedral visits and, I have to say, this was an impressive one. Even the children found it mildly interesting. Seriously recommended if you find yourself in the area. 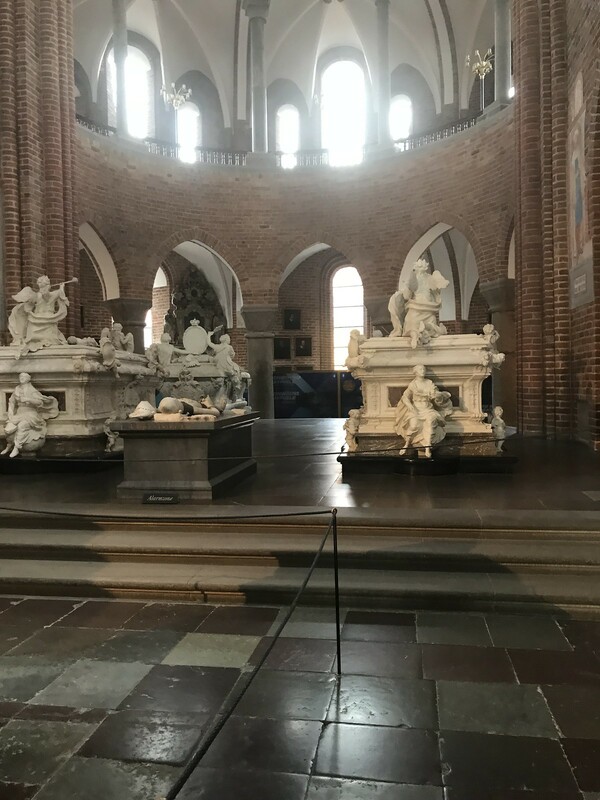 Most of the kings and queens of Denmark since Margarethe I in the 1400s are buried here and some of them really went all out in the chapel design. A couple of pre-Margarethe kings are buried here also. 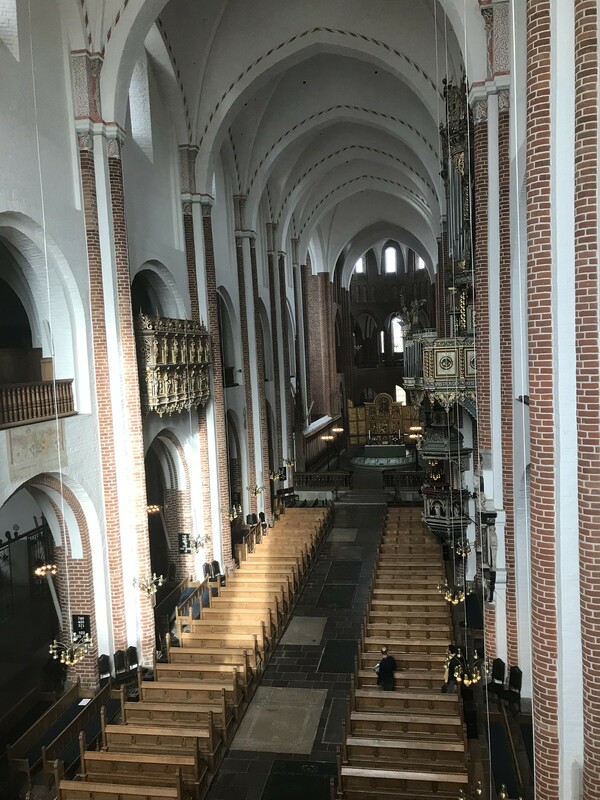 If you’re looking for the body of Harald Bluetooth, the man who gave us wireless connectivity, look no further, he’s been here since about 986. 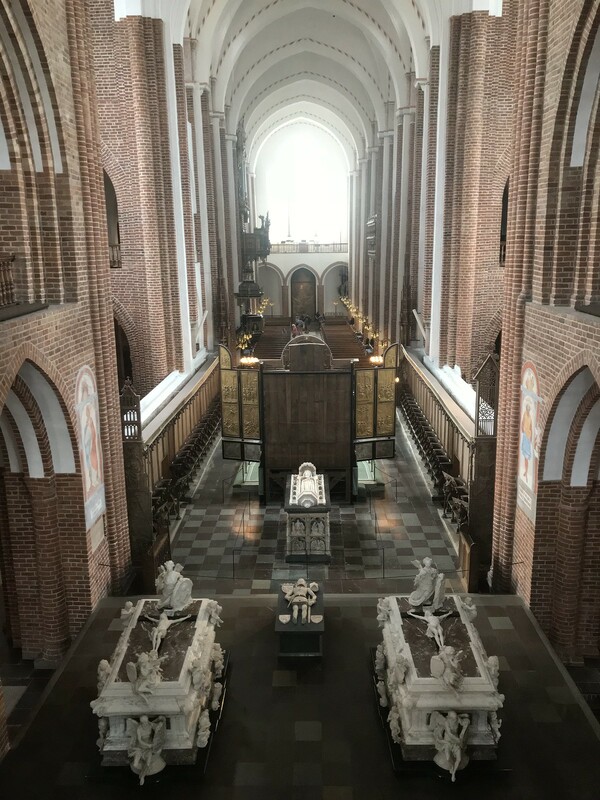 Controversially the French (and slightly grumpy) prince consort who died earlier this year decided he didn’t want to be buried in Roskilde. Nevertheless the queen has a large sarcophagus for herself in situ and more or less ready to go for when the moment arrives. 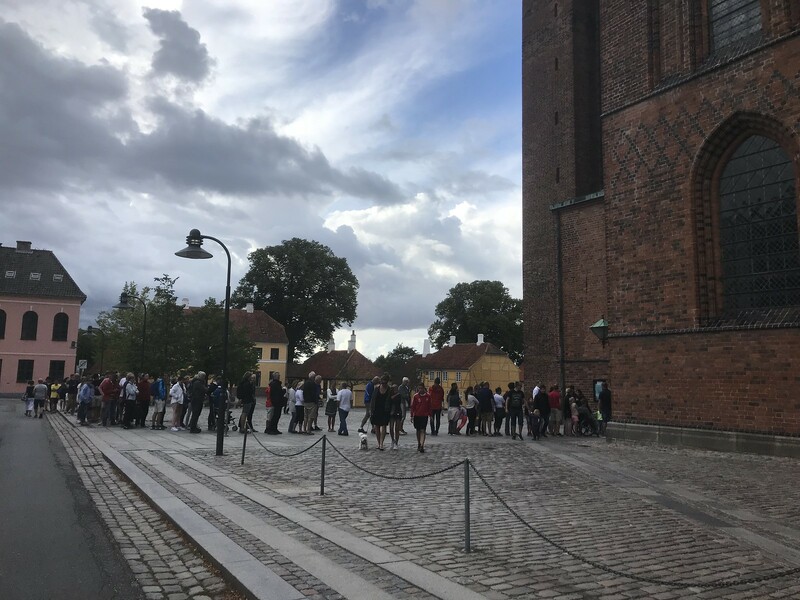 Good planners, the Danes. The cathedral is made largely of brick which is a big part of why it has the UNESCO world heritage label as you don’t see so many elaborate brick buildings dating from the 12th century. Well worth the wait in the queue. 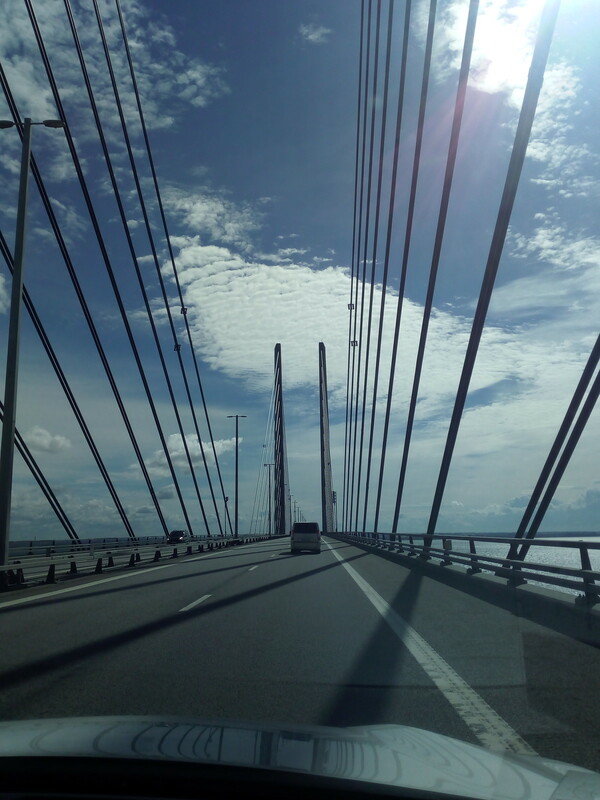 We took the bridge to Sweden. It was very thrilling. I drove and one of the disadvantages of our hired car over slightly longer distances became clear. The driver’s seat had a button which pushed it forward automatically. Either I am too short for the Qashqai or we never figured out how the buttons worked properly. 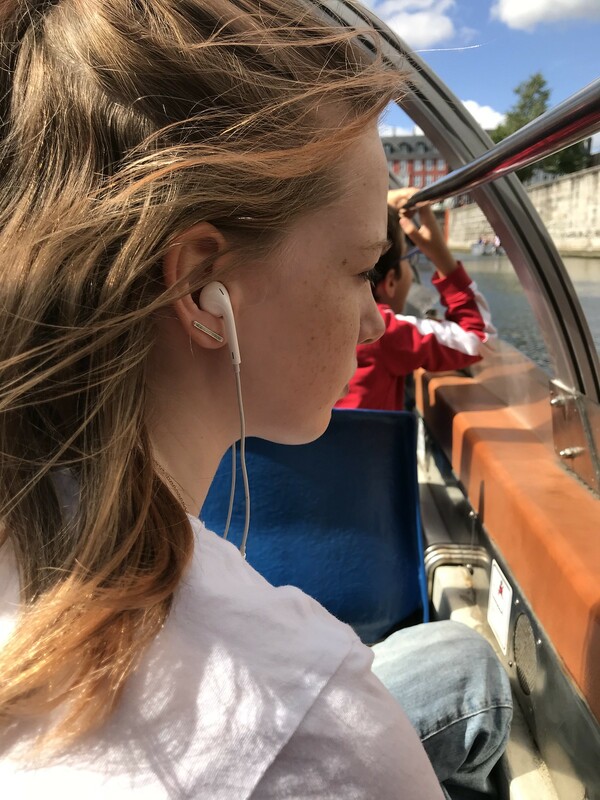 My little arms were stretched out in front of me to their fullest extent and, as we crossed the bridge, I started to get pins and needles in one arm and waved it about to the general discomfiture of my passengers who opined that we were all going to die. 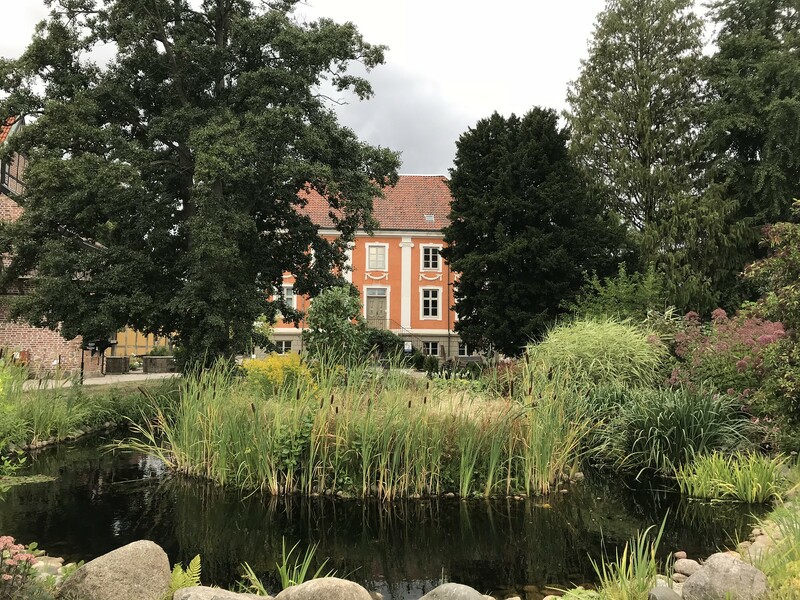 We went to Lund as I had been there at a conference years ago and liked it. 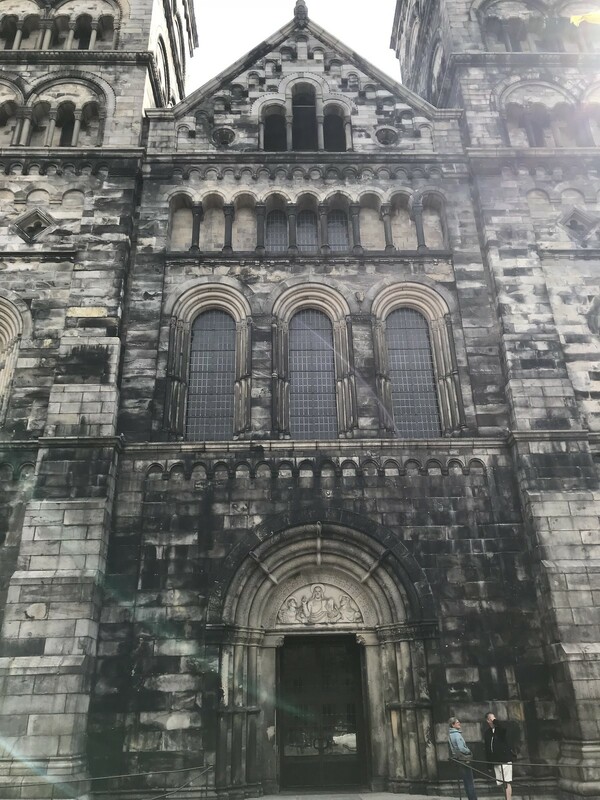 After Roskilde the day before, I am forced to concede that Lund cathedral was a bit underwhelming. 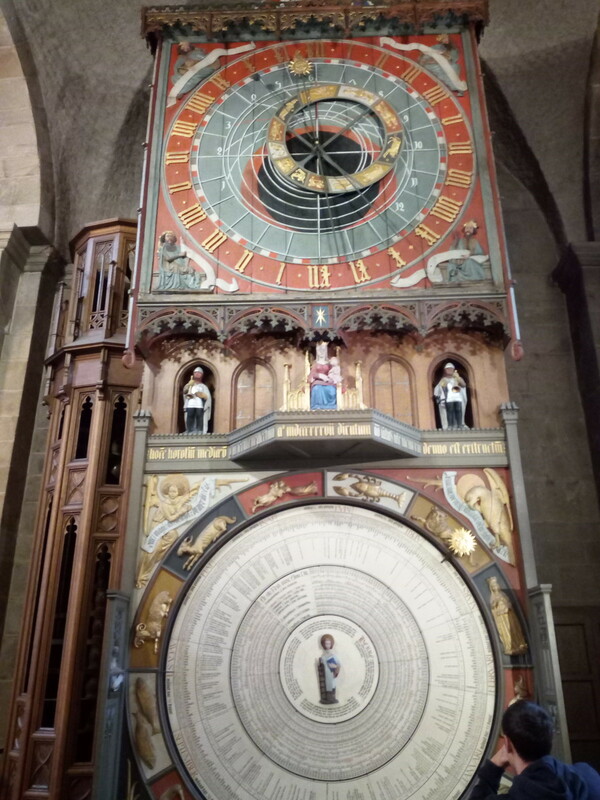 It did have an astronomical clock though. After the priciness of Denmark, Sweden seemed really cheap and cheerful. I bought a Moomin mug for €15 and was delighted with myself until my husband pointed out that a) I’d just spent 15 quid on a mug and b) the Moomins are Finnish. Subsequently I saw the exact same mug in Denmark for €21 so I was relieved that I had made a killing after all. We went for lunch in a student burger joint (Lund is a university town) which was surprisingly tasty. I was astonished to see that they had a sign outside saying “no cash”. Apparently Sweden is one of the world’s most cashless societies but somehow, I always thought cash would be king in a student burger place. 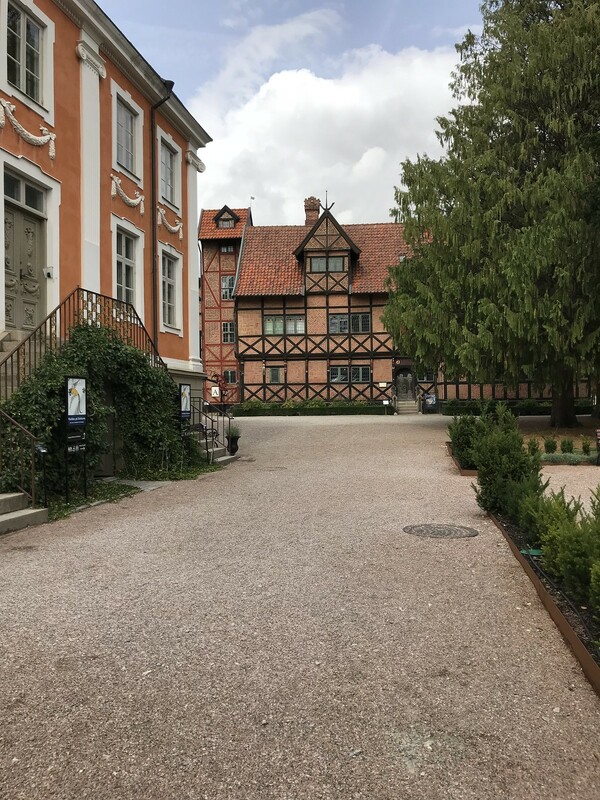 Lund boasts an open air museum with lots of different traditional houses. I love this kind of thing so we went there. 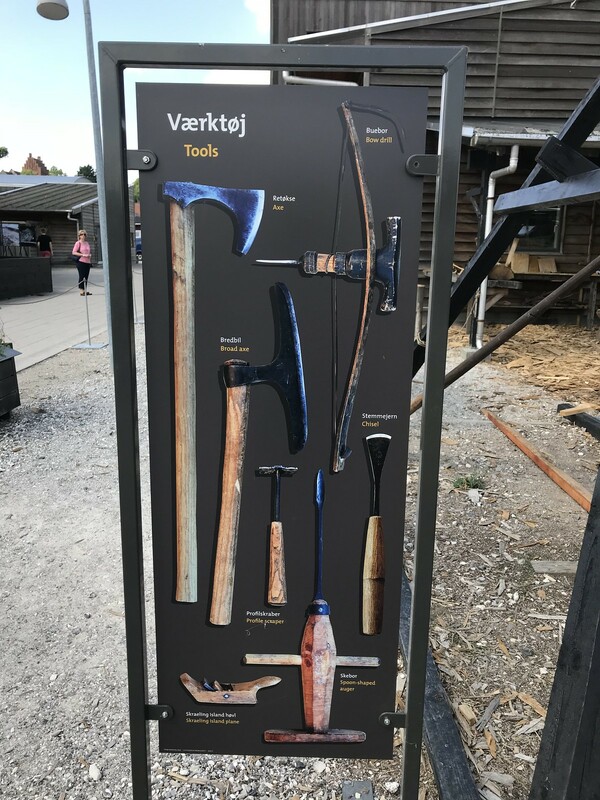 Herself pointed out that thanks to this obsession of mine she knows more about how blacksmiths operated in the 19th century than she does about paying electricity bills and observed that I may not be preparing her for life in the 21st century. 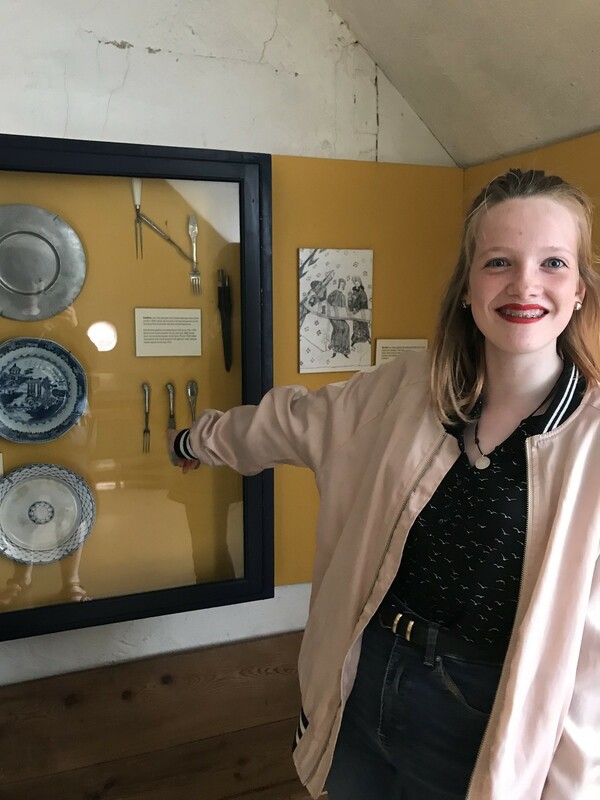 “I bet,” she added “that we will see loving examples of early butter knives.” We did see loving examples of early butter knives. At least there were no people dressed in clothes from the relevant periods guiding us around. The place was slightly run down and quite empty but, I must say I found it delightful. 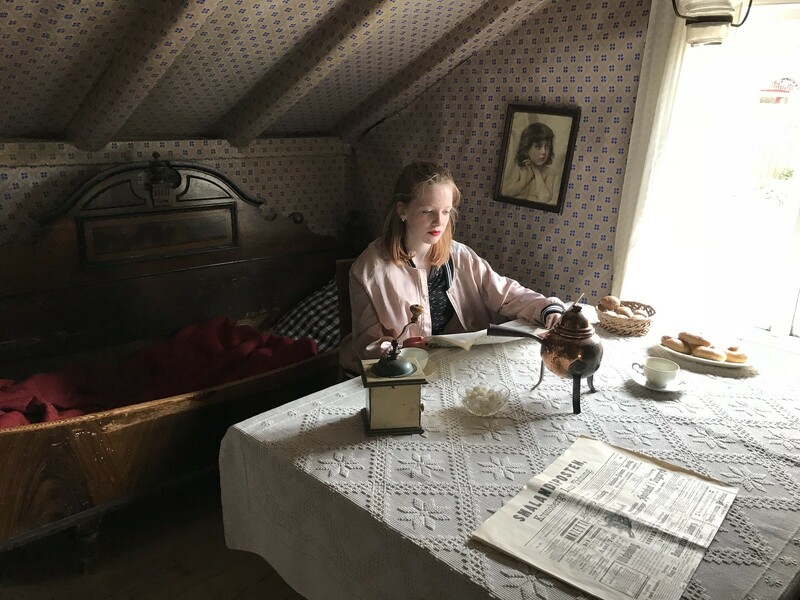 For those of you who have spent time in IKEA, you will be pleased to hear that there was a house from Småland carried safely from there to Lund for educational purposes. There was a Jane Austen exhibition looking at the dramatisation of her work including original costumes from the BBC best ever Pride and Prejudice adaptation which some of us quite enjoyed. When we got safely home (thanks Sybil) it was late; after dinner and a brief row over the adapters for charging the phones, we all went to bed. Top tip, if you have a family with five phones; bring more than four adapters on holidays. If you must only bring four, make sure that they all work. People, we’ve still almost a week to go. Can you face it?